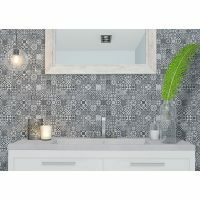 Moon (Black) is a contemporary indoor feature wall tile that is ideal for use in bathroom and shower walls. It features an elegant black design that consists of an array of subtle concave moon impressions to offer an elevated level of style and sophistication to your bathroom design. Moon (Black) feature wall tile measures 250x750mm in dimensions and are sold per piece. Add a touch of glamour to your bathroom with this feature wall tile. Create a seamless look in your bathroom by adding this feature tile to your shower walls. The black finish complements a range of design styles, colour schemes, and fitting finishes – especially matt black tapware. Experience superior quality with Moon (Black). 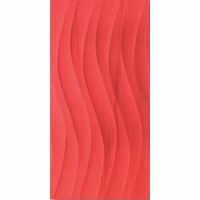 This feature wall tile displays quality manufacturing and is incredibly long-lasting. 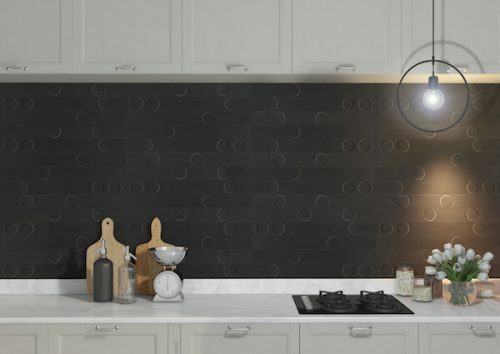 For a contemporary indoor feature wall tile in Perth, nothing beats Moon (Black). 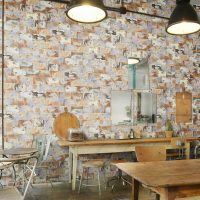 Buy this feature wall tile at the lowest price in the market from Ross’s Discount Home Centre’s online store today and take advantage of our free Perth Metro shipping for all online orders.